Today, we gathered photos of master bedroom designs with different colors to help you choose which color to pick. It varies from modern, contemporary to eclectic, but all of these designs suggest one thing – tranquility. After all that is the main purpose of having a master bedroom, right? To have a peaceful retreat from our busy lives brought about by our day-to-day activities. We know that choosing the right palette for your master bedroom is not a simple task, so if you may, you could also seek advice from color experts or professionals. 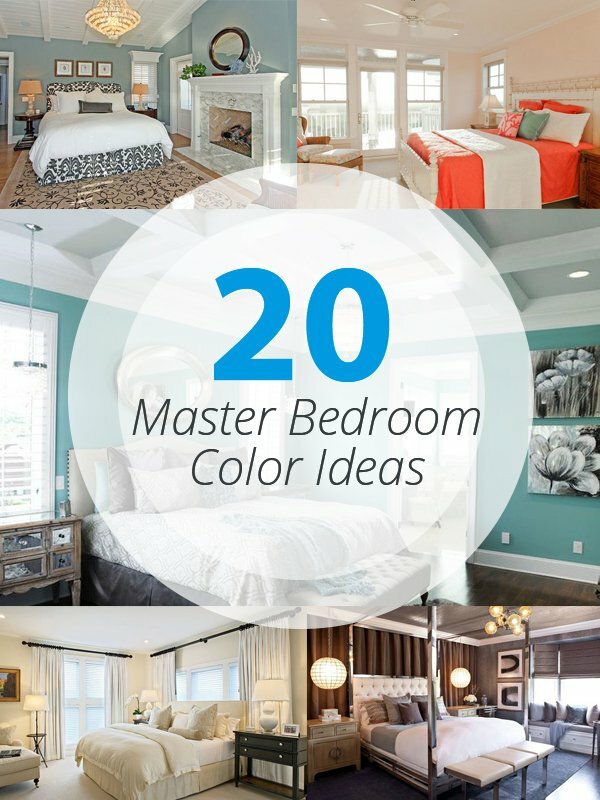 But if you are looking for inspiration, here are 20 Master Bedroom Colors that can give you the relaxing mood you want. This Spanish Olive on the walls matched with bluish-grays on the furniture projects a light and classic mood. This color scheme is so calming. 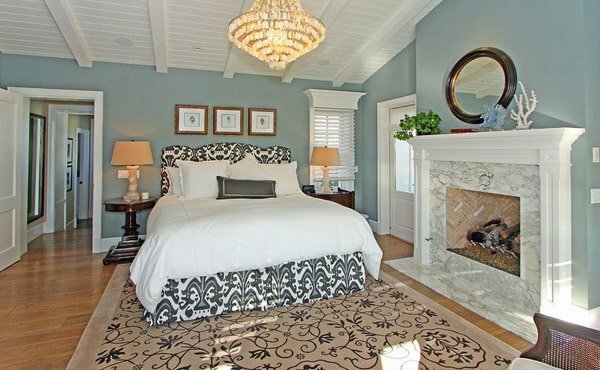 Are you in for a subtle, fresh and romantic color for your master bedroom? You can try this monochromatic scheme of peach. It’s simply pretty and inviting. 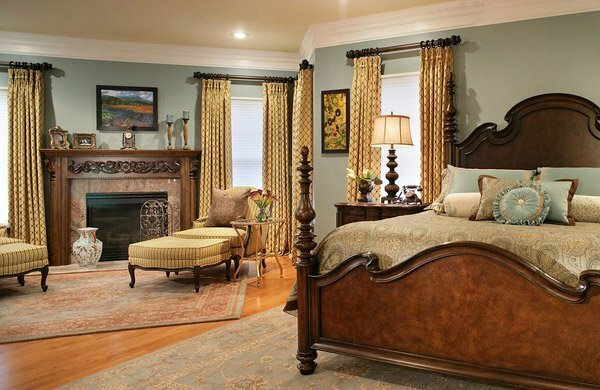 Teal and gold combination for a master bedroom is an exceptional choice. 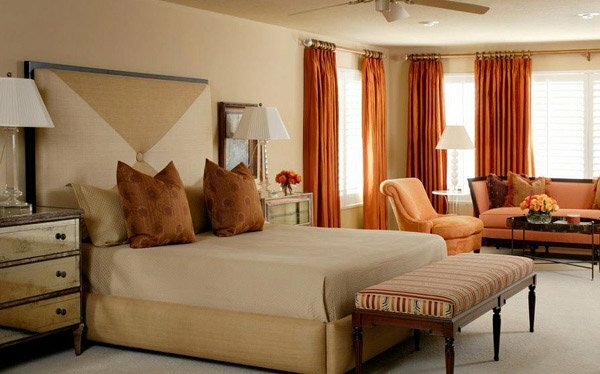 In this traditional master bedroom the colors add cheerful, fresh yet welcoming and warm atmosphere. Get a casual yet elegant feel in this color scheme-blue, black and white. Keep the colors simple while the luxurious accessories take care of the punch in this country master bedroom. 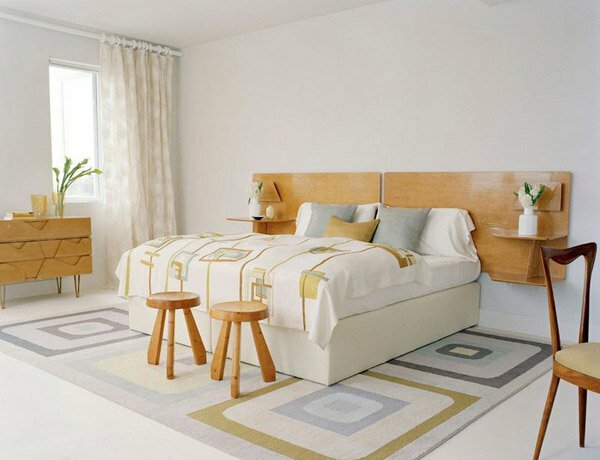 This is a perfect combination of different variations of white to keep the room from being too stark and dull. Creamy white walls, crisp white curtains, mix of different patterns and textures with a punch of black make it a relaxing and soothing haven. Chartreuse, yellow and white color scheme provides a serene yet refreshing feel in a master bedroom. A lovely combination of toned blue and gray! The color scheme creates a modern flair with soothing yet cool atmosphere. White with beige and pops of red color scheme in a modern master bedroom design, instantly create a statement of cleanliness and brightness, like a piece of heaven on earth. This chocolate-colored walls and sumptuous textures create an inviting and comfortable feel while the decors and accessories provide a cottage charm. 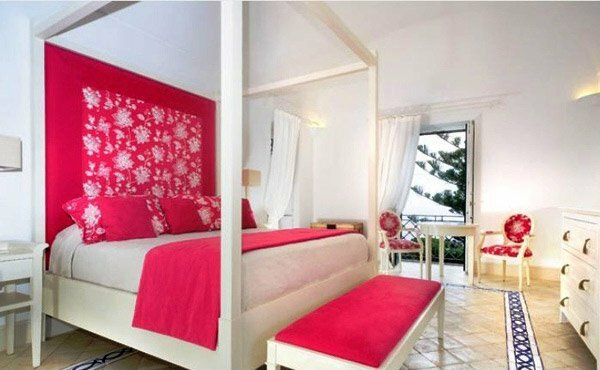 Do you want to splash some hot pink on your master bedroom? Then you could try this concept of Fabrizia Frezza Architecture and Interiors, pink is balanced with the white base keeping it simply pretty and still welcoming. 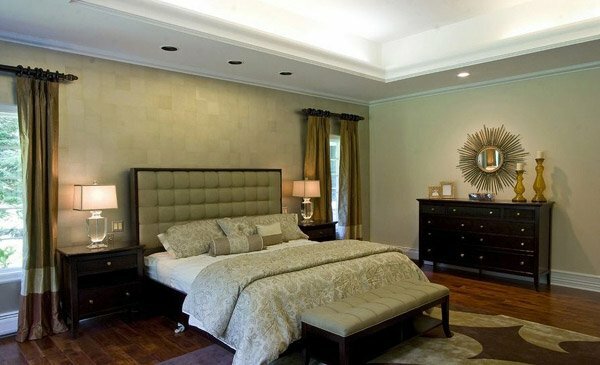 Design a master bedroom that will let you enjoy the luxury and tranquility with this color palette and design. Beige, cream, hints of gold and silver make fancy, neutral classic choice. 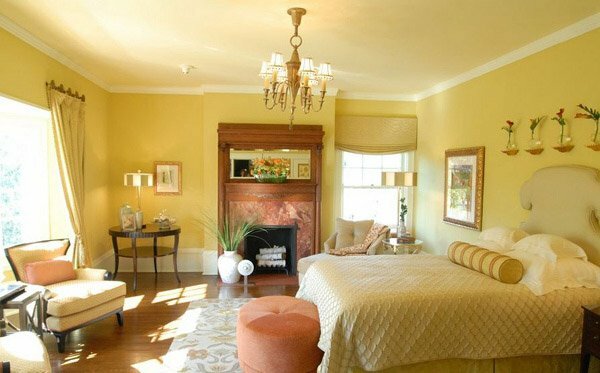 A butter yellow master bedroom paired with peach accent makes a lovely combination. Update your master bedroom with the lighter shade of sage and accentuate it with purple accessories like this area rug for a modern touch. We love the metallic finishes and the Hollywood glam lightings in this master bedroom especially on how the soft grays, blues and purples balanced the whole appeal by toning it down to a soothing view. A sophisticated color scheme of charcoal gray, white and yellow! The deep gray exude a feeling of drama and elegance while the contrasting effect of yellow and white makes it vivacious. 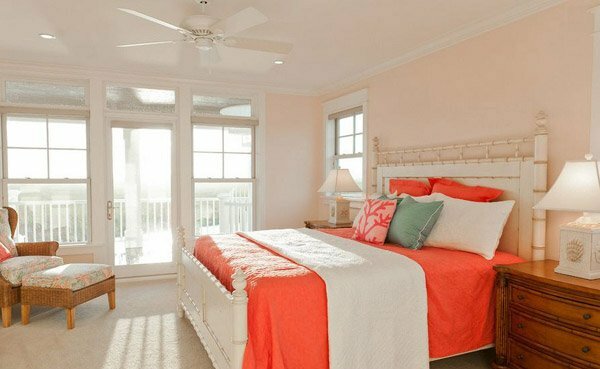 For those who love orange, this master bedroom design is for you! Pair your neutral walls with warm colors like this fiery orange creating a feel that is not too over stimulating but is relaxing and comfortable. Create a print on print scheme on your master bedroom with this design on soft floral blues. 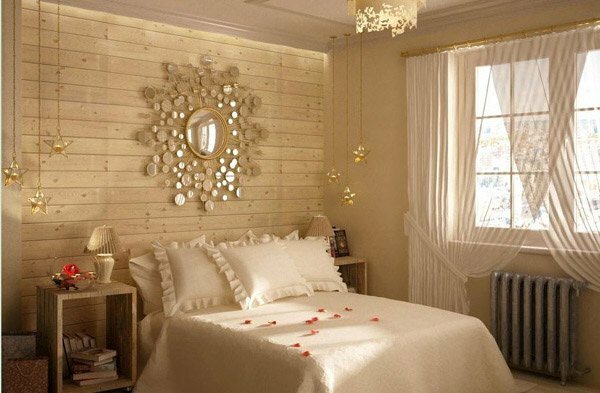 It will give a chic, calming and a bit romantic and country-feel in your master bedroom. Can’t get enough of the romantic red for your master bedroom? 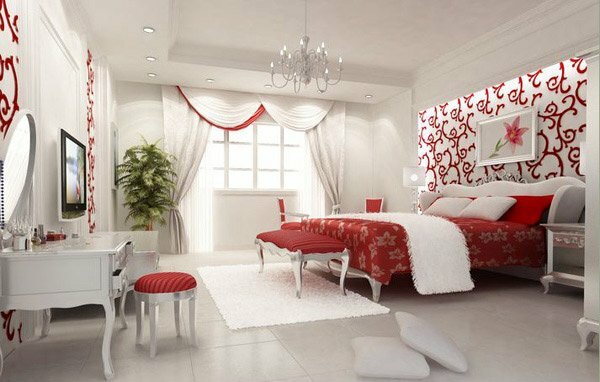 Take a look at this stunning master bedroom design with splashes of red that exudes charm, romance and elegance on a white base. A soft, modern appeal is achieved in this geometric-inspired master bedroom design. The wood makes this room standout and the geometric patterns on the fabric both on the duvet and the area rug add a modern glam. 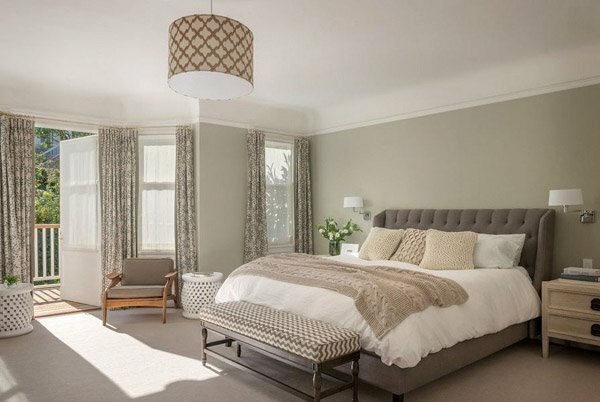 Total peace and tranquility is achieved when you use neutral colors or earth tones for your master bedroom like this design. Dark woods, browns and tans, cozy lighting, right intensity of patterns and textures will definitely bring that Zen atmosphere everybody wants to have in their bedroom. 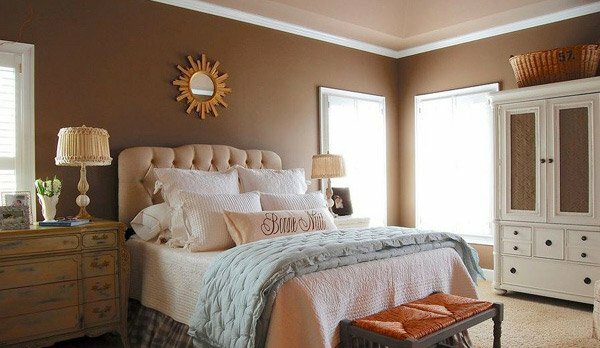 We hope this collection of 20 Master Bedroom Colors help you in narrowing your option. Limit your choices to those colors that will complement your existing furniture or features that you would want to retain. Remember to use a color that dominates the room to tie up the scheme; otherwise it will only give you chaos. It is important to establish a color scheme to ensure visual harmony. Check on more bedroom color schemes if you did not find what you want here. Follow homedesignlover’s board Bedrooms on Pinterest. that is great and the best ideas. Can someone tell me where I can find the gray rug in the blue and gray room? Does anyone know where to find the wallpaper/stencil, or something similar, in the red and white room?